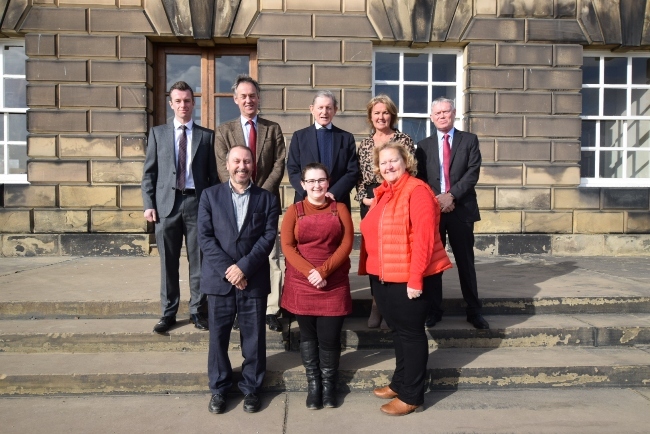 Wentworth Woodhouse Preservation Trust’s pool of expertise has been strengthened with the appointment of six new trustees. Established to secure a long-term future for Wentworth Woodhouse, the trust is now governed by a dozen trustees. Their valuable skills and knowledge range from construction and law to finance, business management, conservation architecture and the upkeep of historic buildings. But the newest is a 19-year old student from Kimberworth. Toni Paxford is learning the ropes as an apprentice trustee – and bringing the views and interests of young people to a board which from the off has included the Duke of Devonshire and Rotherham businesswoman Julie Kenny CBE, whose passion drove the £7m purchase of the house in May 2017. Toni is no stranger to making her voice heard. She is a former member of Rotherham Youth Cabinet and in 2017 launched Paige’s Project, a support group for 11-25-year-olds with an ‘invisible’ illness. “Wentworth Woodhouse has always fascinated me. My grandparents and mum used to tell me stories of the house and the family and as a young person who is very active in the community my aim is to spark an interest with other young people,” said Toni, who is currently studying Youth and Community Work at a local university. Meanwhile, Henry Boot Construction boss Simon Carr has added his weight to the board. Simon has been with the Sheffield-based construction giant for over 30 years and was made its MD in 2009. He is also a non-executive director of Wildgoose Construction, Alfreton. Simon recently stepped down from the Sheffield City Region Local Enterprise Partnership, having served as a private sector board member from 2010 to 2018. He is also a board member and former chair of the National Federation of Builders, a board member and past president of the Yorkshire Builders Federation and sits on the CBI Construction Council. The Trust also welcomes the senior-level financial expertise of Sheffield Chartered Accountant John Caldwell, MD of Rotherham-based international firm S3 ID Group, which designs and sells electronic safety equipment for the oil, gas and energy industries. “I am delighted to be able to use my professional experience to support Wentworth Woodhouse, a majestic building with a very important social history which I found out about just four years ago when I read the book Black Diamonds and took tours of the house,” said John, a Sheffield father of three who has a proven track record in fundraising and its accountability to banks and corporate finance institutions. Also welcomed is Keith Knight, a specialist conservation architect for over 30 years. He is a former English Heritage historic buildings architect and a Building Conservation Officer for a National Park and a London Borough. Now running his own practice in York, Keith is chair of the Yorkshire Branch of the Institute of Historic Building Conservation. Lawyers Rachel Cowper and James Berry have also been welcomed as trustees. Rachel, of Wetherby, is Head of Legal for Yorkshire developers Berkeley de Veer Group. She was a real estate partner at Leeds law firm for 10 years and co-ran the firm’s Corporate Social Responsibility Programme. James is a partner with national law firm Freeths LLP and specialises in Dispute Resolution for clients in manufacturing, construction and technology. He lives in Sheffield and is a governor at Sheffield Park and Sheffield Springs Academies.